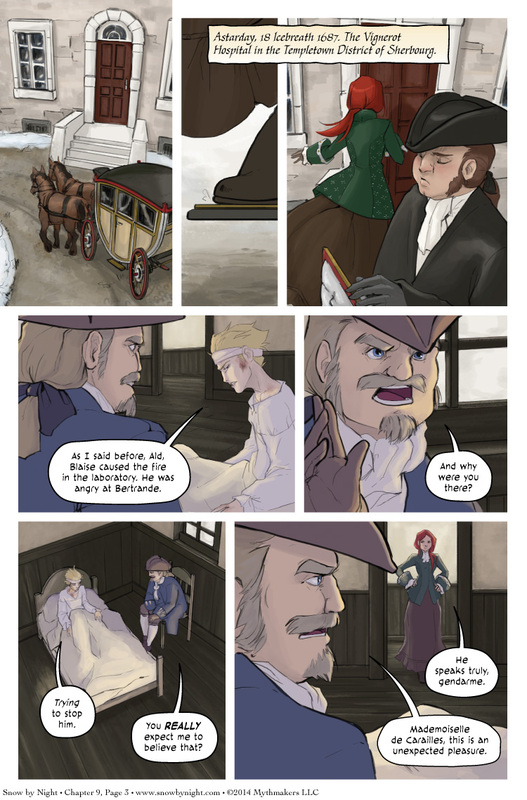 We return to Sherbourg in Chapter 9 Page 3, where we find Jassart receiving a lot of visitors as he recovers in the hospital. To see a bit more of this charming scene, please vote for Snow by Night at Top Web Comics. August is quickly approaching and that is the month of cons. Diane and I will be attending Otakon on Aug. 8-10. You can find us at Table M-03, right across the aisle from Ianua and next to Spinnerette. We’ll have some new top secret prints, but also a new booth set up. Diane and I have reimagined our table as a colonial trading post complete with chests, baskets, blankets, and crates. I’m really pleased with how well it came together. We couldn’t have done it without some supplies from the Smithsonian Museum of the Native American Indian and some gift baskets from the Red Lake Nation (their wild blueberry syrup is incredible). GenCon follows on the heels of Otakon on Aug. 14-17. Busy month! Jassart….now you’ve done the unforgivable. I for one appreciate the irony that Jassart’s statements are factual (*) but without essential context create a narrative of the events of last chapter that is entirely false. I’m not surprised that Ald is pressing the investigation a bit harder than I dare say he has for many a burglary. An alchemist dying when her lab goes up in flames under suspicious circumstances is serious business. Figures he’d pin it as murder or manslaughter on Blaise. Ah, Jassart, still being the jackass I hate.